Kickoff: the day in which the next season's FIRST Robotics Competition game is released, allowing a team to begin the arduous and extraordinary process of game and rule analysis, strategy, design, fabrication, electronics, and programming. Today marks the first day of this six week period, for many students the last one we'll ever experience. Today was packed- nearly sixty individuals crowded into K2 this morning at around 6:30 PST to decide our 2018 Robot name and attend kickoff. The team decided to name this year's robot Emma, the Embryologist. The game is FIRST Power Up, an arcade-themed challenge in which robots attempt to gain control of their alliance's Switch, a central Scale, and their opposing alliance's Switch in order to incrementally score points during a match. Robots can gain control of their alliance's switch by placing Power Cubes, thirteen inch square milk crates, onto each side. Power cubes can also be given to an alliance's Human Player on their respective alliance station wall by entering the cube into the Exchange Zone, where it is entered into that alliance's Vault to score points and earn Power Ups. At the end of the match, robots may climb onto the central scale to score additional points, and may also hang from/climb on other team's robots. Today, we began with an intensive rule analysis to ensure all members know the game thoroughly. We conducted a game simulation, as well-after tracing a 1:1 scale model of the Arcade onto asphalt, humans pretended to be robots in order to learn how to play the game. This allowed our strategists to develop insight into the role the Vault, Scales, and Switches will play during the match, and how Power Ups could be utilized to most effectively score points. Using these fundamental robot requirements, we were able to begin setting derived and driven requirements for our other systems, currently divided into three rough areas. structurally support the weight of the gamepiece in addition to it's own structure in compression. We decided to use our standard 6WD WCD drivetrain for this game due to the relatively flat and familiar surfaces. However, CAD analysis of the drivetrain ground clearance profile suggests that the bottom of the chassis would have less than one eighth inch of clearance from the platform zone ramp at the closest point. For this reason, we decided to use six inch wheels to refrain from concerns which might arise from driving onto the platform zone at an angle. We have not yet decided an objective floor speed or if we plan to use pneumatics in this robot for a shifting gearbox. 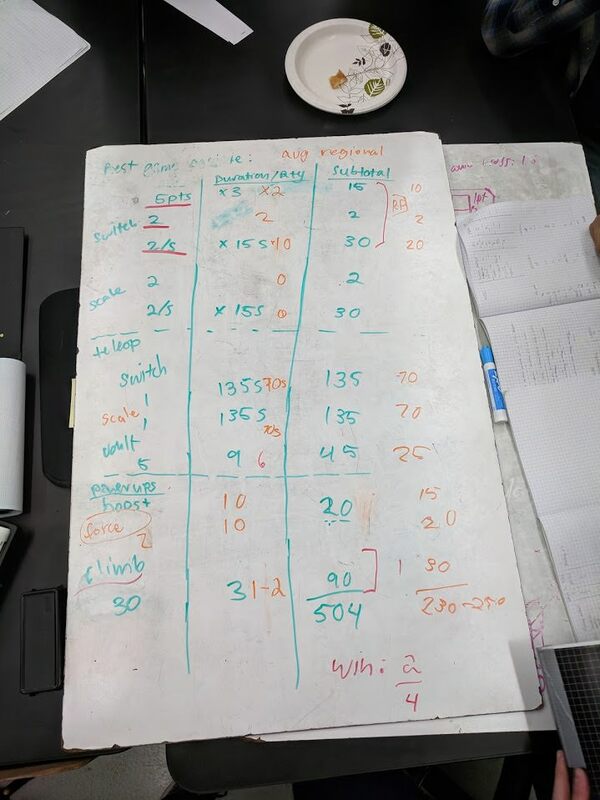 Tomorrow, our objectives are to take the rules test, resume discussion, research existing mechanisms, begin fabricating game elements, and begin prototyping for potential designs.